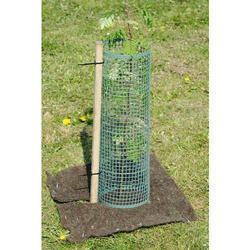 Providing you the best range of Fabricated sapling protector with effective & timely delivery. Fabricated Sapling Protector used to protect saplings from rodents, flies, birds and other intruders is an effective alternative to metal meshes and other similar meshes available in the market. It comes with a painted MS frame. In addition, our Sapling Protector is Durable, Weather and Corrosion resistant and is relatively Lightweight. Looking for Sapling Protector ?